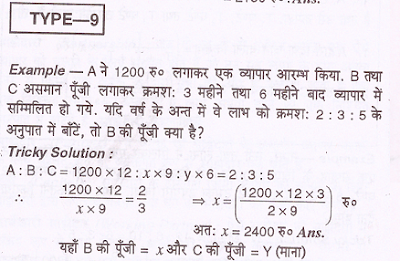 In this article we serve most important and useful short tricks of partnership questions in Hindi as well as English. 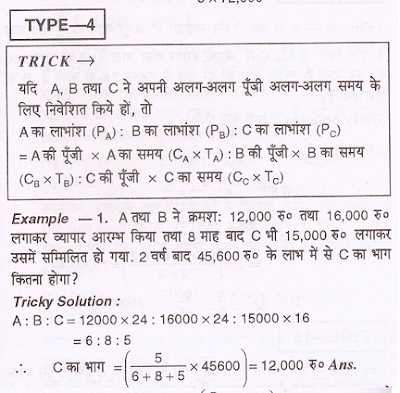 It is very useful tricks for those candidates who want to crack various national level and state level emulative examinations. 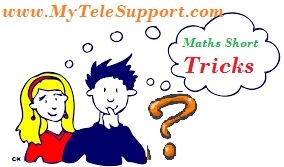 In this article we also share some most important questions which asked in frequently in the exam. A partnership is an arrangement where parties, known as partners, agree to cooperate to advance their mutual interests. The partners in a partnership may be individuals, business, interest-based organization, school, government or combinations. The money, property , and other valuables which collectively represent the wealth of an individual or business. Profit of A (Pa) Profit of B (Pb) = Capital of A (Ca) : Capital of B(Cb). 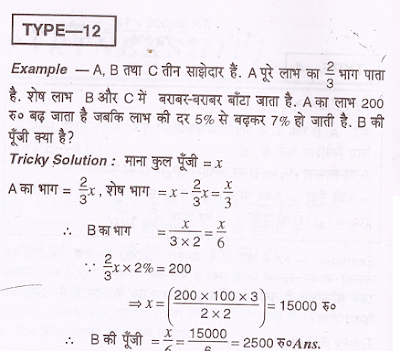 Example :- X and Y together started a business. In the end of year they divided the profit into ratio of 2:3.If X invested 40000 rs , then who much wealth did Y invested? 4. A, B and C enter into partnership. A invests 3 times as much as B invests and B invests two-third of what C invests. At the end of the year, the profit earned is Rs. 6600. 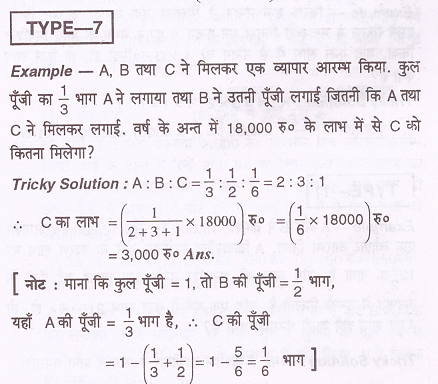 What is the share of B? .. Ratio of their capitals = 2x: 2x/3 : x = 6: 2: 3. Four milkmen rented a pasture. A grazed 24 cows for 3 months; B 10 cows for 5 monthr, C 35 cows for 4 months and D 21 cows for 3 months. If A’s share of rent is Re. 720, find the total rent of the field. -> 72: 50 : 140: 63. Hence, total rent of the field is Rs. 3250. A invested Rs. 76,000 in a business. After few months, B joined him with Re. 57,000. At the end of the year, the total profit was divided between them in the ratio 2: 1. After how many months did B join? Suppose B joined after x months. Then, B’s money was invested for (12 — x) months. Hence, B joined after 4 months. the initial investment of each. Let the initial investments of A, B and C be Rs. 3x, Rs. 2x and Rs. 4x respectively. = 3 : 4 : 5. C’s initial investment = 4x = Rs. 3,60,000. Example :- Deepak , Ram and Amar invested 2700 rs , 8100 rs and 7200 rs and started a business. In the end of year Ram got profit of 3600 rs , find there total profit. Example :- Rajan invested 15000 rs and started a business. After 3 month Ajay invested 45000 rs and jointed the business. If in the end of year profit of 5850 rs will gained, then find difference between profit og Ajay and Rajan. Example :- A and B invested 12000 rs and 16000 rs and started a business. After 9 months C also invested 15000 rs and join the business. After 2 years they bought profit of 45600 rs, find the profit of C.
Example :- A and B get a grassland on rent of 30 rs/month for 10 months. If A's 10 cows graze for 9 months, then how much cows should B graze so that he has to pay 60 rs less rent then A? Example :- Nayar , Mani and Lona get a video shouting unit on rent of 9800 rs for one week. They sequently used that unit for 12 hours , 6 hours and 10 hours. How much rent Nayar had to pay ? Example :- A, B and C together started a business. A invested 1/3 part of total capital and B invested amount that A and C together invested . In the end of year how much profit did C got from total profit of 18000 rs ? 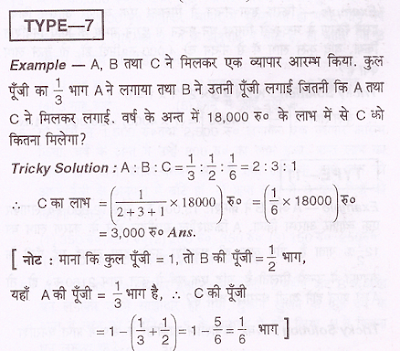 Example :- A and B together started a business and invested capital in ratio of 4:5. After 3 months A take bake 1/4 part of his investment and B takes 1/5 part of hos investment. After 10 months of starting they got profit of 3800 rs ,how much money did B got from the profit? Example :- A invested 1200 rs and started a business. B and C invested different amount of capital after 3 months and 6 months sequentially and join the business. If in the end of month they divided the profit into ratio of 2:3:5 , then how much capital did B invested? Example :- Kiran and Nandan together started a business. Kiran invested thrice more capital then Nandan for double of time. 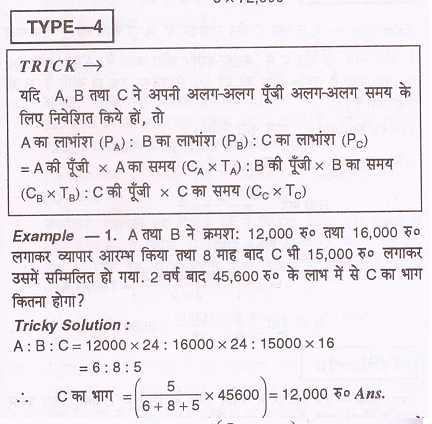 If from the total profit Nandan got 4000 rs, then find the total profit. 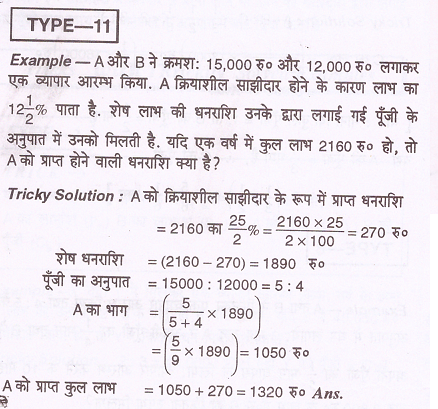 Example :- A and B sequentially invested 15000 rs and 12000 rs and started a business. A is a effectual partner so he got 12(1/2)% of total profit. The remaining amount of profit both of them got as the ratio of there investment. If 2160 rs is total profit, then how much profit did A got? 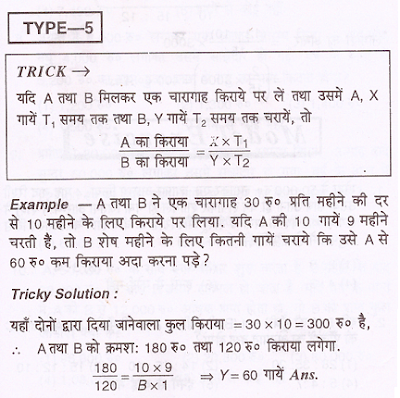 Example :- A, B and C are three partners. A got 2/3 part of total profit. 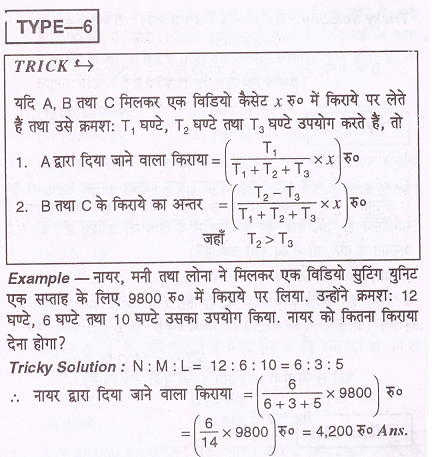 The remaining profit is divide equally between B and C. Profit of A increased by 200 rs when total profit increase from 5% to 7%. 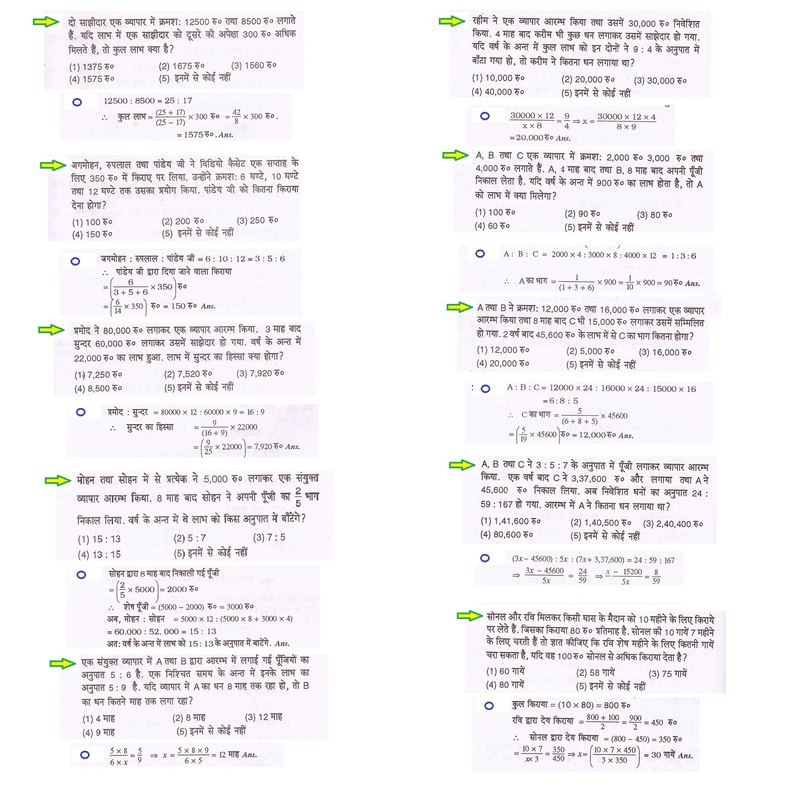 Find the capital of B. 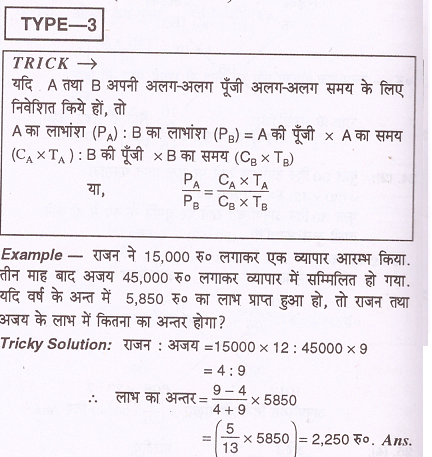 Example :- A, B and C invested capital for same time in such way that if A got 2 rs profit then B will get 3 rs and if B got 5 rs then C will get 4 rs of profit. Such that B get 3000 rs from the profit, then how much profit did A and C will get?